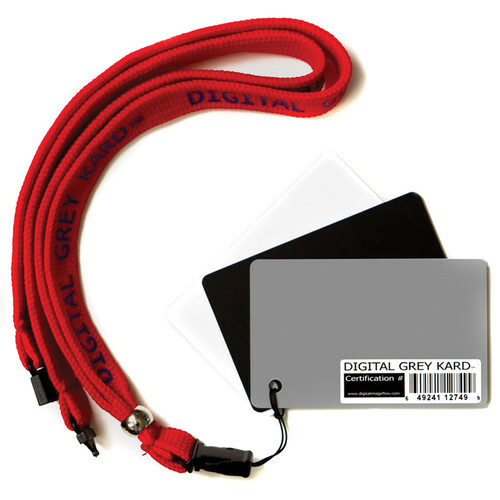 The Digital Grey Kard Premium White Balance Card Set with Premium Lanyard (Set of Three Cards) from Digital Image Flow brings science to the art of digital color control. Digital Grey Kard is the user-friendly, economical, and indispensable color correction tool that belongs in every photographer's bag. Digital Grey Kard gives you perfect digital color every time. By using this set of three cards - Black, White and Neutral Grey simply take a picture of the card in the same lighting your subject is (or was) in. Use auto white balance and P (Program) mode for the picture. You can either use the resulting picture as the basis for a custom white balance setting, or you can use the White Balance Card Set picture during post processing for a custom white balance. Note: The DGK-2 differs from the DGK-1 with the addition of the detachable clip, which allows the cards to be released from the lanyard. Box Dimensions (LxWxH) 7.2 x 2.7 x 1.3"
Digital Gray Kard Premium White Balance Card Set with Premium Lanyard (Set of Three Cards) is rated 4.5 out of 5 by 98. Rated 5 out of 5 by Anonymous from Digital Grey Kards Are Great! I used the Grey Kards to correct color cast on some pages of a book I was photographing (using my DSLR as a scanner). There was a purple chapter tab on the page that was throwing the color off, making the pages appear a dirty dark gray, rather than white. I set the gray Grey Kard near the edge of the page, shot the photo, then used Color Cast correction in Photoshop to make the page appear white, then I cropped the Kard out of the image and had my desired composition. Color Cast Correction did not make the page white without the Grey Kard, the cast was too gray. The Kards are large enough to show the camera what gray is, and small enough to be portable and easily placed in any shot. Rated 5 out of 5 by CF Photo Video from Very convenient set of Grey Cards I am a Photographer & Videographer and I use this set of grey cards to adjust my White Balance, Mids and Blacks in Post using PS CS5 and FCP7. I find this set to be the most convenient set you can find because of its size and because it's on a very premium landyard that allows you to carry along with ease. If I'm out on a shoot I just throw the landyard around my neck and use it accordingly. It's all about preference for most people. Some people might prefer to have very large grey cards but I find this set to be just perfect for my liking. The size of this set of Grey cards is about the size of a Baseball card. Rated 1 out of 5 by Penguin Arts from Compact size is a little too compact I purchased this product with the intention of using it to set white balance in the field. I really liked the lanyard idea and the fact that I could keep it around my neck while doing shoots. The cards are too small for this purpose and using them indoors for setting the white balance on my workstation defeats the whole purpose of them being so small and on a lanyard. I did however, like the quality of the cards themselves. Rated 5 out of 5 by Guillermo Esteves from Works as advertised. The product consists of a set of three cards made of what seems to be a durable material, possibly plastic, one grey, one white and one black. The cards are about the same size of a credit card, so you could easily keep them in your wallet and carry them everywhere, but they also come with a handy lanyard. There are two ways to use them. The first one is by using the custom white balance function in your camera. My camera, a Canon PowerShot G10, works by enabling that option, and then pointing it at something white to set the appropriate white balance. You just put the white card under the same light as the subject, set the white balance, and you're good to go, repeating when the lighting changes. If you don't use post-processing software such as Aperture or Lightroom, you should use this technique. The second way works by setting the white balance during post-processing. Before you take your photo, take a test shot of the grey card, making sure it's under the same light as your subject. Take more if the lighting condition changes. Then, in Aperture, you can set the white balance by clicking on something that's neutral grey with the white balance tool; click on the grey card in your test photo, and then use the same white balance setting on the rest of your photos. With either technique, this product will guarantee you'll get the correct white balance and get rid of color casts every time. Rated 5 out of 5 by PaintedCanvas1975 from Easy and Quick Way to Set Balances I used these cards on a video shoot at the end of each session and it worked super easy. The only complaint that I have was the lack of instructions on assemble of the cards. It sounds stupid, but there was a metal ring and a string, and I assumed you used the metal ring like a key ring, but this isn't the case, you put the string through all three cards, and then hook it together and attach it to the ring. Overall, this a great product for the money, and easy to pack into a bag, especially when you are traveling. Are these plastic, ie waterproof for underwater photography? Yes, the cards in the DGK Color Tools Digital Grey Kard Premium White Balance Card Set made out of plastic making them suitable for underwater photography.